White Widow Marijuana Seeds Grow Set Review. 3 protection formulas, specially designed to prevent and reduce attacks from mould, fungus and many bugs and pests including spider-mites. 4 individually formulated packs designed to meet all the nutrient needs of your crop, during each stage of its development. Find out more about The Complete White Widow Seeds Grow Set. Read the complete White Widow Seeds Review. 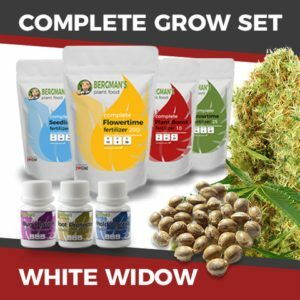 Buy The Complete White Widow Seeds Grow Set today and receive free worldwide shipping guaranteed.